People in different countries have their own ways of observing Christmas. It is the most joyous day of the year. Many of the festivities are based on a family’s culture and the way ancestors celebrated the holiday. Whether it is grandma’s delicious fruitcake that she makes every year, or the angel that has been in the family for generations and put on the tree, every family has traditions that make Christmas special. All around the Caribbean, activities generally heighten in preparation for the holiday. While it is a favorite time of the year for many, it involves enormous work and decision making, which include home décor, the purchase of gifts, cards, clothes, and of course, food. The types of foods served at Christmas time is one of the many manifestations of cultural connections between the Caribbean islands. Many seem to prepare the same types of dishes, but with different names. And although many immigrants from the islands are now showing a growing North American influence in food preferences, whether they are home or abroad, traditional dishes remain among the favorites. We still enjoy our local foods right here in the United States. There is nothing like the variety of dishes that we enjoyed at home during that special time of the year. In Jamaica where I am from, one of the biggest traditions in our Christmas celebrations was the feast. On Christmas day, we would go from house to house having dinner. Every home had lots of food. Mutton, pork, beef, chicken, rice and peas, yam, banana, fried plantain. To refuse food offered to you was to insult your host, so you had to have a bite. 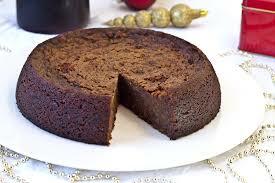 Desert would include cakes in a variety of forms: rich fruit cake, special Christmas cake, heavy cake, black rum cake, or puddings. Today, Christmas in Jamaica may be somewhat different from what we have as our special memories. My hope, however, is that, whether we are at home or abroad, we’ll put our hearts into making more good memories and keep alive the ones that make our celebration unique. Have yourselves a peaceful, merry Christmas! Put fruit and suet in bowl. Add breadcrumbs and spices and mix well. Blend in beaten egg, essence, liquid and stir. Add sifted flour, baking powder and salt; stir again. Cover with two thicknesses of greaseproof paper and tie down well or cover with aluminum foil. Steam for 3-4 hours in a large saucepan with boiling water, or cook in a pressure cooker, for one hour. Enjoy!